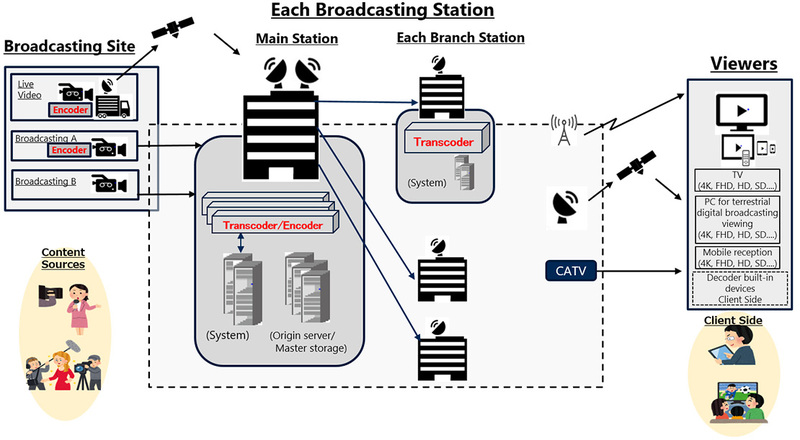 Codec for Broadcasting Equipment (4K/8K HEVC LSI) | Socionext Inc. In the broadcasting industry, supporting the distribution of high capacity video data (whose resolution is increasing) such as 4K broadcasting has created challenges with regards to transmission bandwidth requirements and increasing running costs for storage consumed by video data. 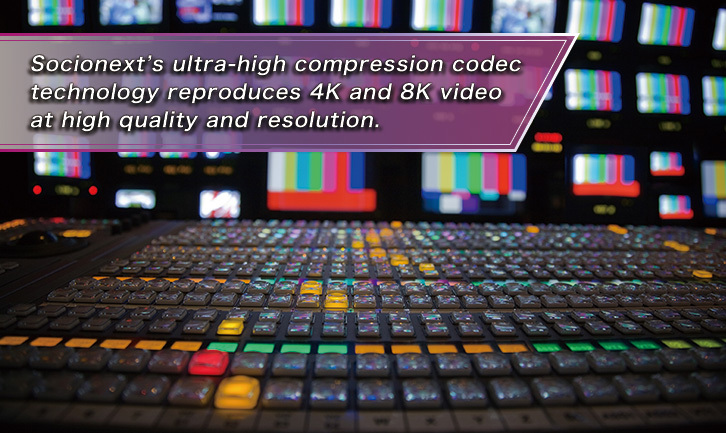 High compression, high quality, and high resolution encoding of 4K video in real-time with no fluctuations is achieved with Socionext’s codec LSIs, the Multi-Channel Encoder MB86M31 and the Multi-Format, Multi-Channel Codec MB86M30 supporting the leading-edge H.265/HEVC. They also contribute to reducing running costs and power consumption as well as to saving space thanks to their high processing density and Adaptive Bit Rate (ABR) output function. 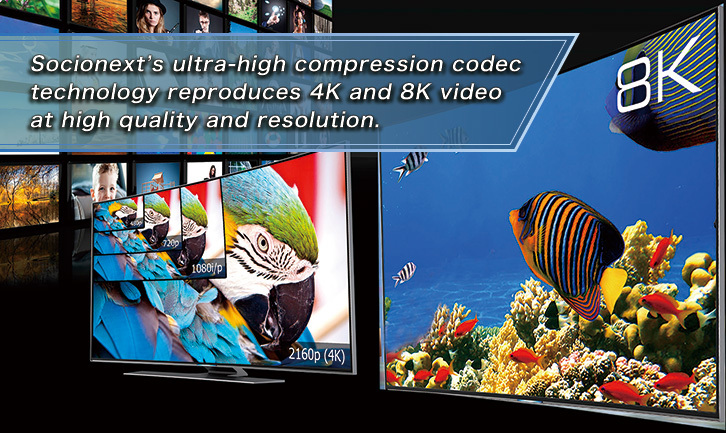 These codec LSIs support HDR, which significantly enhances the brightness of video. Peak brightness (nit*) can be increased to 100 times that of conventional video. Unlike the synthetic HDR applied for digital cameras, the supported HDR realistically reproduces the various brightness levels existing in the real world for the entire system by subdividing the brightness. The MB86M31 is a dedicated H.265/HEVC encoder LSI that compresses high quality, high definition 4K video (4K60p 4:2:2 10bit) required for digital broadcasting at real-time processing speeds with no fluctuation. The MB86M31 performs simultaneous multi-channel encoding, up to 4 channels for full HD video and 16 channels for SD video. Its 4-chip configuration provides 8K video (8K60p 4:2:2 10bit) encoding at high quality, definition and compression in real-time. With these processing technologies, the MB86M31 can reproduce an exceptional sense of being there and a natural reality, which can only be achieved with 8K video. The MB86M30 is developed as a successor of the MB86M31 and inherits the features of the MB86M31. The MB86M30 is a codec LSI that achieves multi format (H.265/HEVC, H.264/AVC and MPEG2) encoding, decoding and transcoding in a single chip. Those customers who are considering operating a new system along with their existing one (H.264/AVC, MPEG2) can significantly reduce transmission bandwidth requirements and running costs for storage consumption by partially applying the HEVC specification codec while supporting existing systems. "The advanced data processing capability provided by Socionext’s HEVC codec will be an important key in realizing new innovative applications, including ultra-high definition (UHD) and virtual reality (VR). Combining its amazingly high efficient and strong performance with general-purpose boards and integrated systems provided by us will allow our customers to launch their products into the market early, accelerating the deployment of their next-generation video products." "We use the MB86M30 codec LSI for the 'Real-Time Video Transmission System series,' a codec system for broadcasting services that we launched in November 2016. By using the LSI in combination with our video technology, we have achieved one of the world’s smallest and lightest systems with high image quality."